In need of modernisation - detached bungalow comprising 2 double beds, wet room, kitchen, lounge, driveway & garage, front & rear gardens. Double Glazing,Gas central heating. Situated in the popular Woodside development within the Parish of Hutton, a modern brick-built detached bungalow, which is in need of general modernisation. The accommodation enjoys the benefit of UPVC double glazing, gas central heating and refitted wet room. The property further benefits from front and rear gardens, driveway and garage and is offered with vacant possession A good range of local facilities are available nearby in Oldmixon, including shops, primary school and bus service into Weston high street, town centre and sea front which are approximately 2 miles distant. The nearby village of Hutton offers further facilities. ENTRANCE HALL L-shaped hall with loft access, double radiator, telephone point, built-in cloaks storage cupboard, built-in storage cupboard and boiler cupboard housing the gas fire combination boiler. 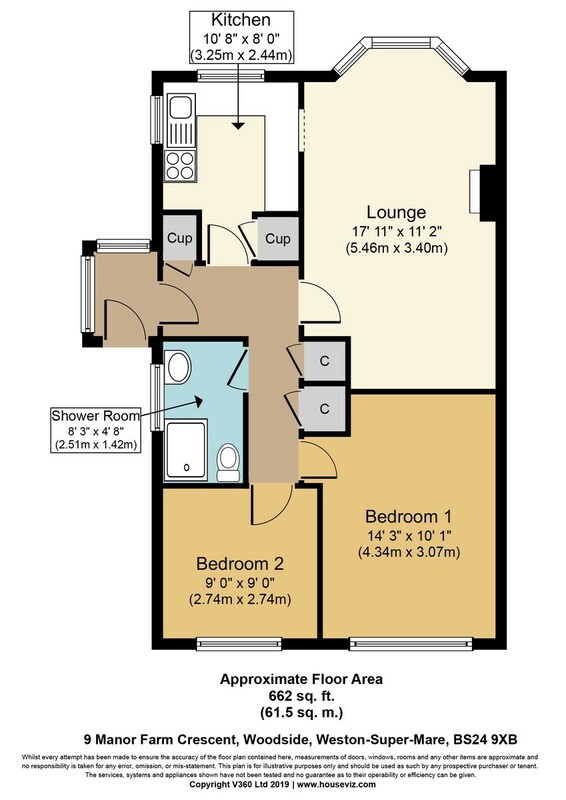 LOUNGE 17' 11" x 11' 2" (5.46m x 3.4m) UPVC double glazed south facing bay window to front, gas fire (not tested), double radiator, TV point, glass serving hatch to kitchen. KITCHEN 8' 8" (2.64m) extending to 10' 8" x 8' 0" (3.25m x 2.44m) Fitted with single drainer stainless steel sink unit with cupboards below, base cupboards, roll edged worktops, tiled surrounds, wall cupboards, gas cooker point, plumbing and space for washing machine, double radiator, built-in larder style cupboard, UPVC double glazed side window and UPVC double glazed south facing window to front. BEDROOM 1 14' 3" x 10' 1" (4.34m x 3.07m) UPVC double glazed window to rear, double radiator. BEDROOM 2 9' 0" x 9' 0" (2.74m x 2.74m) UPVC double glazed window to rear, double radiator. WET ROOM 8' 3" x 4' 8" (2.51m x 1.42m) Fitted with white suite comprising mains shower with curtain and rail, wash hand basin, low-level WC, tiled surrounds, double radiator, obscure double glazed side window. OUTSIDE South facing front garden with screen of hedging approached from Oldmixon Road, predominantly laid to lawn with chipping stones, pathway and gate with access either side of the property leading to the rear garden. REAR GARDEN Fenced and enclosed the garden is predominantly laid to chipping stones and concrete pathway with screen of hedging.